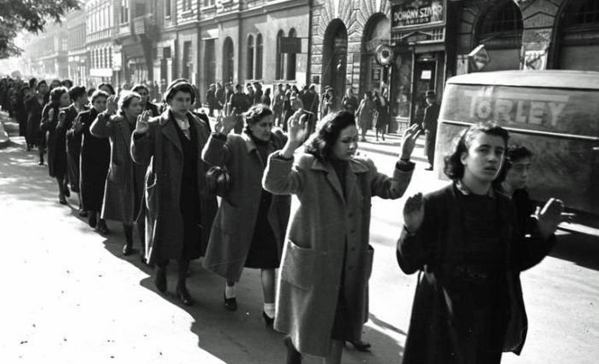 Captured Jewish women in Budapest in October 1944. Source: Wikimedia Commons. A new Holocaust education program is being trialled across selected Adelaide high schools in a bid to further help the younger generation understand why any form of anti-Semitism or hatred is “unacceptable”. The pilot program will be taught at 12 high schools over the next few months as part of the Year 10 curriculum before it will be incorporated into Adelaide’s first Holocaust museum. The Adelaide Holocaust Museum and Steiner Education Centre has enlisted an educator to develop and deliver the program, which will then transition into an in-house resource at the museum when it opens in Adelaide later in the year. The centre’s chairperson, Nicola Zuckerman, said it was vital to keep teaching the younger generations about the atrocities that occurred in the past. In November, the Executive Council of Australian Jewry reported an unprecedented 60 per cent rise in anti-Semitic incidents across Australia in 2018. Around the world, Jewish groups have reported similar concerns. An Adelaide Jewish leader last year called for stronger hate crime laws after pro-Nazi stickers appearing around the city, including at a local synagogue. Yesterday, video surfaced of a man making “vile” remarks to a rabbi during a road rage incident in Melbourne. Ms Zuckerman said the program would expand to include more schools and regular educational visits to the museum. She said teaching about historic mass murders and genocides such as the Holocaust would equip students with the knowledge and compassion they need. “There are some places and countries where it’s not taught, it’s not acknowledged and younger generations don’t even know what occurred,” she said. “We have to do our best, I think, to ensure that we create a society that is understanding, compassionate and accepting of all people. The South Australian Government has provided a $50,000 grant for the trial program, beginning in February. In a statement, Education Minister John Gardner said the program was an important initiative. “The Holocaust is one of the most significant and traumatic events in modern world history,” he said. The museum is now under development and will include a permanent exhibition room with a mix of artistic, audio and visual displays about the Holocaust and a gallery dedicated to survivor stories. The educational resource is expected to incorporate a range of technologies and opportunities for student interaction, including an in-house web app. The museum, which will become the first of its kind in Adelaide, has been funded by grants and donations. A family with one side “charred and reduced to ashes” tries to make meaning of the intergenerational trauma. Ms Zuckerman said the funding goal of $250,000 had nearly been reached and preparations were now well underway for the project. “We’ve almost reached our target for what we believe we need to essentially develop and build the museum and get it open, so we’re very pleased about that,” Ms Zuckerman said. The museum will be located at the historic Fennescey House on Wakefield Street, which has been donated for use by the Catholic Archdiocese of Adelaide. Work has now begun on the design of the permanent exhibition and educational resources. The project has also received support and input from the Sydney Holocaust Museum, the University of Sydney and the University of Adelaide. The museum is expected to open in mid-2019.